You might think you are seeing double, but in fact you're looking at identical twins and world leading tennis doubles players, Bob and Mike Bryan. Bob and Mike Bryan are your Connectors of the Day. The reigning ATP world tour champions, the Bryan brothers, are on a crushing pace to win their ninth tour level title of the season after winning their eighth championship earlier this month in Cincinnati. Earlier in the year, the Bryan brothers reached their 600th match win. Born in 1978, the twins began playing tennis at an early age and in fact, won their first tournament together at the age of six. In 1991, the pair won their first national title at the USTA's national boys' 14 doubles championships. In the following years, the Bryan brothers continued their quick climb to the top of the tennis world ranking winning championship after championship. They made their professional and Grand Slam debut in 1995. Since then, the pair have won titles ranging from the Australian Open, the U.S. Open, Wimbledon and the French Open. 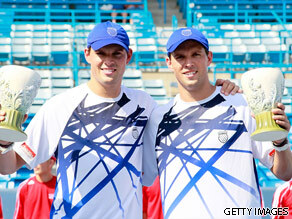 Here's your chance to quiz tennis players Bob and Mike Bryan. Do you want about their chances at the upcoming U.S. Open? Do you want any tennis tips? How has being identical twins helped in their quest for tennis glory? – What is your opinion on the way Barack Hussein Obama is Improving the Tennis World? – What is your opinion on the way Barack Hussein Obama is Improving the Health, Safety and Well-being of ALL Sports? – What is your opinion on Heroin, Cocaine, Marihuana(Cannabis) and Prescription Drugs(medication) Addiction in the Tennis World? I am awaiting Bob and Mike Bryan’s replies. What do you think of the current Davis Cup format? How would you alter it? What do you think the USTA can do to create more buzz for the event/ties? Thanks and congratulations on everything you have achieved! It's so much fun to watch you two play. I would love to hear more about Half Hour Power - how does this workout compare to what you have already been doing? - would you suggest this to the recreational player? - Please tell me more. Thanks and good luck the Open!!! Who is your favorite tennis personality of all time and why? Who is your favorite historical person of all time and why? Best of luck at the Open and always. Thanks for playing for the KC Explorers! I sure enjoyed watching you play here. Can you tell me why ESPN or the other networks won't show more of the doubles matches? It really bugs me during rain delays when they RE-show a previous singles match, or even a "classic" singles match when they haven't even shown any current doubles! I don't have the Tennis Channel and I really enjoy watching and learning from your play. Thanks, too, for always displaying good attitudes and good sportsmanship. Good luck at the US Open! I would love to know, how long is the greatest amount of time you've been apart and do you think you will ever live apart? Have you ever considered what it would be like if you hadn't been twins? You're the best! But I RARELY get to see you play on TV. What needs to be done to increase the popularity of you and doubles in the media? Would you kindly describe how young traveling professional athletes such as tennis stars go about getting an education? I heard that Maria Sharapova, for instance, at one point took correspondence courses towards a high school diploma. Michelle Wie, for a second example, attends Stanford University but I'm unclear how since she travels so much. How does it work and who is doing it? How about yourselves? I'd like to know, if each of you had the chance to have a "Battle of the Sexes" rematch, which player past/present would you like to play and who would win the match? -How long do you see yourselves playing professional tennis for? Do you think you would retire before the age of 35? What about at 40? -What are your plans for after you retire? -What do you think needs to be done in order to increase interest/participation in tennis at the grassroots level? Thanks for your time and good luck at the US Open! First of all, congratulations for your accomplishment. Second, I go every year to Roland Garros (but I live in Paris, so no merit), I am quite desappointed, so when am I going to see win the title ? Why can you not make it ?